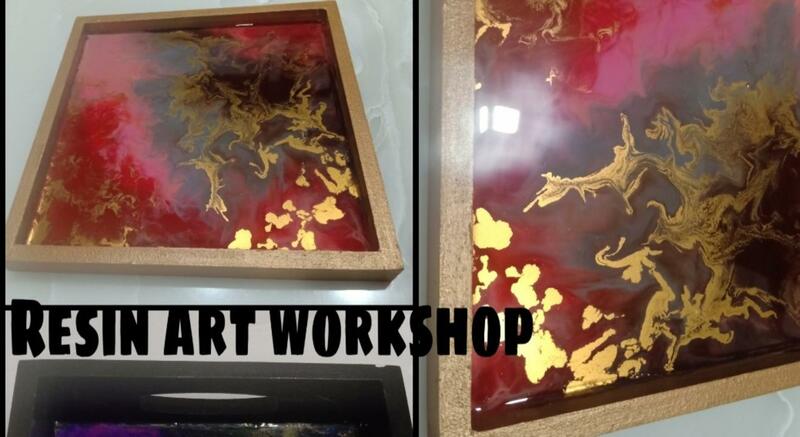 An Interactive session of creating "Resin artwork". We will be working upon the basics of Epoxy Resin and how to create a beautiful abstract Resin Tray. Resin gives you creative freedom - colors ,sparkle etc and the glass finish look leaves you in an awe..!! Epoxy resins are a two-component system consisting of resin and hardener. By mixing the two components, a chemical reaction takes place so that the liquid resin gradually hardens to a solid plastic. The result is a high-gloss, clear surface. For the sake of simplicity, we use the term “resin” instead of “epoxy resin”. Resin is not only used in industry and boat building, but also in art. Thus, besides kitchen counters, floors, tables, pictures, jewelery or sculptures can also be cast. The trend to use resin in art comes from the USA, Canada and Australia. In Europe, the technology is still little known. With resin you can create works of art that enchant with their clarity, luminosity, brilliance and depth. Color pigments or other additives are added to the resin. Different effects can be created by choosing the painting ground, the type of casting, the colors and the additives. Even experienced resin artists have never finished learning. If you like experimenting, you will love working with resin. Resin can also be used to finish drawings, photos and pictures (made of oil, acrylic, alcohol ink, watercolor, ink, mixed media, etc.) with a shine that can be created and also to protect them from UV light and mechanical influences.